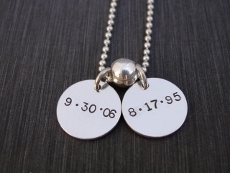 We start out with a custom sterling silver disc and hand stamp it with the name or affirmation of your choice. 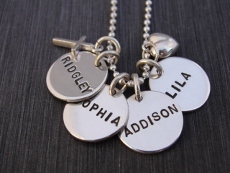 Standard necklace discs are ½” in diameter and can accommodate up to 7 letters. We do have larger discs for longer words (9/16” or 5/8”) and we can also stamp two lines per disc, if necessary. The discs are hung on sterling silver ball chains, which come in 16”, 18” or 20” lengths.